The plants grew to about 3cm and then stayed there until I ended the experiment. 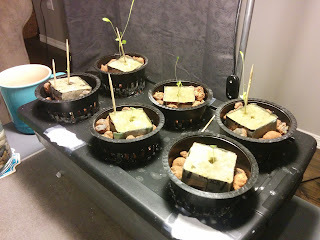 This time around I kept it a little simpler and opted for straight hydroponic setup. 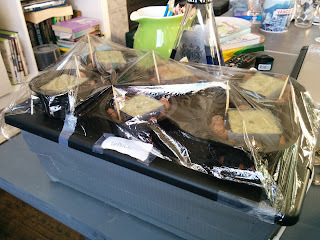 A nutrient solution in the base of the container is wicked up to the grow media via a strip of fabric. The roots should eventually make it all the way down to the solution, taking in both air an water. The light is a CFL bulb which is pretty weak but cheap to run. A nearby window supplements it during the day. I'm growing lettuce and basil. I'm not sure but I think light and heat might be the limiting factors. 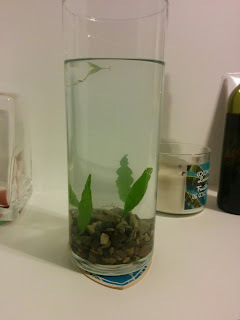 Meanwhile I've started propagating some Java Fern, an aquatic plant, from the aquarium in a nutrient solution in an attempt to increase the amount of greenery in the aquarium.